Conference pears (Pyrus communis 'Conference') are another well-known pear. A sweet and juicy pear, Conference produces very good, reliable crops. Conference pear is also self-fertile, which means there is no need for another pear to be assured your pear crop. The fruits are a medium sized, yellow-green colour with a browny russet colour over parts of the fruit. 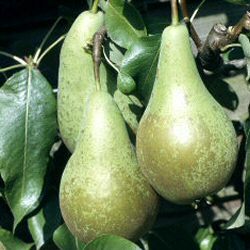 We suggest picking in September and the pears are then ready for eating during October and November. This pear will act as a suitable pollination partner for pears in the flowering periods C2, C3 and C4. This variety of pear tree is supplied in a 5-12 litre container, which means that the tree can be planted any time of the year and with better results than either bare-root or rootballed trees.